Damn, there’s a State of the Union speech tonight after all. We were hoping this “partial government shutdown” business would put the event on ice, at least for one year. Not because we have any animus for Donald Trump, but because we have total animus for the imperial presidency as it’s developed over the last century. The speech has a legacy going all the way back to our first two presidents. Then our third president, Thomas Jefferson, put a stop to it. He thought the spectacle of the executive striding into the halls of Congress was a little too, well, monarchical. So he delivered a written report to Congress instead — a modest, dignified custom his successors maintained for more than a century. Then the worst president ever, Woodrow Wilson, revived the speech to fulfill his monarchical fantasies. And we’ve suffered the consequences ever since. Gone forever were the days of the presidency as a mere “clerkship” — the term used derisively by historian Richard Neustadt in his textbook Presidential Power. Over the last generation, presidents have claimed not only ever-greater powers but also an ever-greater claim on the time of Americans patient enough to watch a State of the Union speech start to finish. Last year, Donald Trump delivered his first State of the Union address. 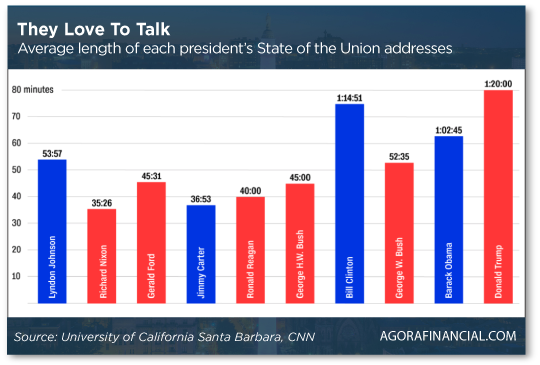 It was an hour and 20 minutes long — a figure exceeded only by two of Bill Clinton’s SOTU speeches. Can Trump redeem himself tonight and bring down his average? Heh… We won’t be staying up to find out. SOTU speeches rarely have an impact beyond the next morning. Trust us, if there’s anything worth following up tomorrow relevant to the economy or the markets, we’ll do so. [Ed. note: Our income specialist Zach Scheidt has prepared his own “State of the Union” message, zeroing in on a crucial topic — American income. Stocks are drifting higher as we move deeper into the month of February. At last check, the Dow and the Nasdaq are both up about two-thirds of a percent, the S&P 500 also up but not as strongly. The Nasdaq’s performance comes despite a drag from Google parent Alphabet. GOOG’s quarterly earnings report sported fabulous sales figures… but traders were spooked by the company’s rising costs. GOOG shares have recovered some of their early losses, but as we write they’re still down two-thirds of a percent on the day. Hmmm… Amazon got the same treatment after delivering its numbers last week. Traders know the post-2008 economic expansion is getting long in the tooth. Rising costs are one thing if you know they’re going to pay off with future sales and profits. Really, that’s been the story behind Amazon’s soaring share price (and ridiculous earnings multiple) the past decade. But the future doesn’t look so certain now… and rising costs look increasingly like a drag. Gold is steady at $1,313. Crude trades at $53.86 this morning — down more than 1% from yesterday, but still far above the $43-ish level of six weeks ago. “The oil market is in a never-ending tug of war between supply and demand,” says our income specialist Zach Scheidt. That’s been the story of the last four months — and a tumble from over $75 in early October to below $44 on Christmas Eve. “The drop in oil prices certainly caused concern for OPEC,” Zach goes on. “Many of its member countries rely on oil exports to sustain their economy. And with oil prices so low, financial pressures started to mount. 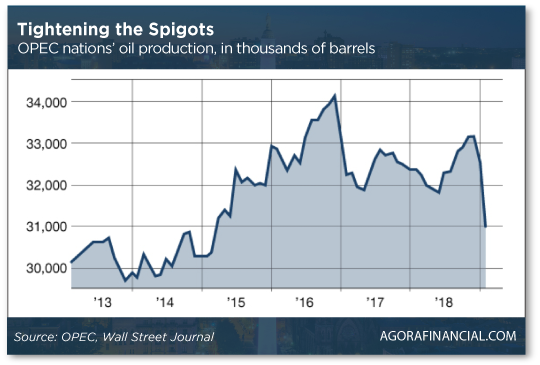 That’s great news for U.S. drillers of shale oil. “They’ve been working hard to reduce their costs as drilling techniques become more efficient,” Zach explains. “But they still pay more to produce oil than traditional drillers. So the lower oil prices in the fourth quarter were challenging for them. Once again, if you missed our earlier announcement about Zach’s “State of the Union” talk addressing American income — and a time-sensitive opportunity — give it a look right here. 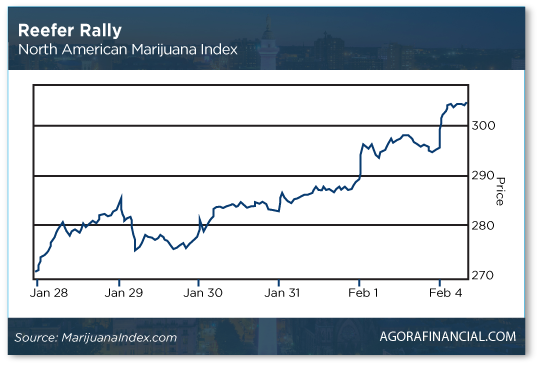 “Pot stocks are soaring over the past five days,” says our penny-pot stock authority Ray Blanco. Ray figured it was coming two weeks ago, after Attorney General-designate William Barr testified at his confirmation hearings that he would not crack down on cannabis in places where it’s legal under state law. “If you’ve sat on the sidelines so far,” says Ray, “now is the perfect time to get in on pot stocks. This surge is powered by strong tail winds that significantly support the long-term uptrend. That’s the conservative way to play it. If you want to step out a little further on the risk curve to capture outsized gains… well, Ray just wrote the book on it. Literally — as you can see here. “I don’t agree with you pushing all this skanky pot crap,” says our first entry in the mailbag today. “How do we meet the very real challenges of a world America is seemingly losing control of if many people in America are all stoned? But you do realize the same sort of arguments were made about alcohol during Prohibition days, right? Somehow we still got by after Prohibition was lifted, while ridding ourselves of the many evils that are inevitable when the law pushes a substance into the black market. And since when is America supposed to have “control of” the world, anyway? “I really liked his comment, ‘Single-payer universal health care is the worst possible delivery method except for all the others.’ It would appear that the U.S., using the ‘others,’ might have the lowest value per dollar health care in the world. The 5: Well, let’s bring it back to our Nordic compare-and-contrast experiment from a few days ago. Per capita health care spending in the United States now tops $10,000 a year, according to researchers from the Kaiser Family Foundation. That compares with a little over $4,000 a year in Finland, about $5,500 in Sweden and $6,500 in Norway. Can anyone plausibly argue that twice as much spending is generating “outcomes” twice as good? Certainly not if you go by average life expectancy, where the United States now ranks No. 31. We’re hard-pressed to think of any other yardstick that would make America look better, either. Having said that, it appears the Democratic Party leadership is determined to kill off “single payer” health care or “Medicare for all” or whatever trendy moniker it’s getting these days. At The Intercept, reporter Ryan Grim has a good scoop about a meeting between Nancy Pelosi’s top aide on health policy and some suits at Blue Cross Blue Shield. Hmmm… Pelosi and company perhaps realize something the single-payer crowd does not. If the end goal of single payer is to eliminate private health insurance (and supposedly bring costs down to a more Nordic level)… what happens to all the “bull*** jobs” that have emerged in the health care industry these last 30 years? We’re talking hundreds of thousands of people pushing paper or otherwise engaged in “health care employment” that doesn’t entail, you know, delivering care to patients. Oh, well. As we said again only yesterday, the system is doomed to collapse under its own weight — probably in less than 15 years. We don’t know exactly what that will look like, but the trajectory is set. You owe it to yourself to see Zach Scheidt’s own “State of the Union” on the crucial topic of American income. Whether you’re retired now, plan to retire soon or if retirement is still far in your future… what Zach has to say could make a huge difference to your retirement lifestyle. Click here to watch his time-sensitive presentation. The link will go dead once the president begins speaking tonight.